After returning from an unsuccessful exploration trip to Labrador, in 1602 George Waymouth set down to write and illustrate his book The Jewell of Artes. Two copies were apparently presented to the new king, James I, in 1604, possibly as part of a search for employment. Two manuscripts exist, one at the Beineke Library at Yale University, the other in the British Library. James Baxter, founder of the Maine Historical Society, had a copy of the British Library volume made, which was on display at the Tercentenary of Waymouth’s voyage but since has disappeared. The Jewell of Artes has chapters on navigation, ship building, artillery and fortifications. It has never been published. 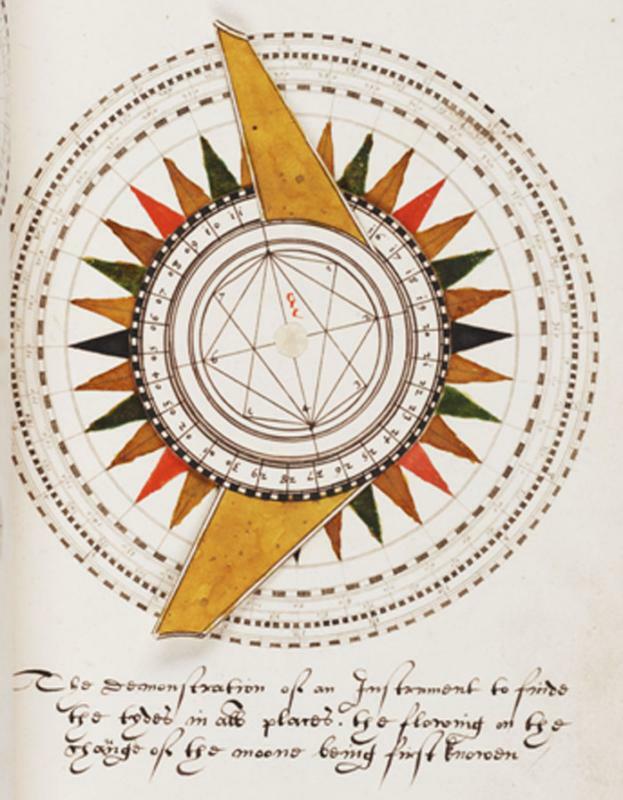 This is his rendering of a nocturnal, a device for determining the time at night by lining up the pointers with stars in Ursa Major or Ursa Minor. Like the real instrument, the arms are movable.